Trending at $13.62eBay determines this price through a machine learned model of the product's sale prices within the last 90 days. N64 Star Fox 64 AUTHENTIC TESTED (Nintendo 64, 1997). Condition is Good. Shipped with USPS First Class Package. There is s name wrote on the front side as pictured. THE GAME HAS BEEN TESTED AND WORKS. THE GAME IS USED BUT IN GOOD CONDITION. THERE IS A LITTLE WEAR ON THE FRONT LABEL. YOU CAN SEE THIS IN THE PICTURES. COMES WITH WHAT YOU SEE IN THE PICTURES, AND THE WAY YOU SEE IT. PLEASE USE THE ZOOM FUNCTION TO LOOK OVER THE PICTURES. PLEASE LOOK AT ALL PICTURES AND ASK ANY QUESTIONS BEFORE BUYING, AS THEY ARE PART OF THE CONDITION AND DESCRIPTION. IF YOU HAVE ANY PROBLEM WITH THE ITEM PLEASE CONTACT ME FIRST. THANKS FOR LOOKING. 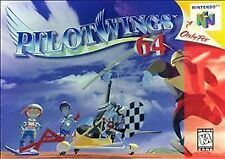 5 out of 5 stars - Pilotwings Nintendo 64 N64 Authentic Sky Diving Video Game Cart OEM Retro GREAT! 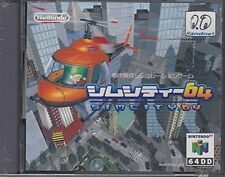 25 product ratings25 product ratings - Pilotwings Nintendo 64 N64 Authentic Sky Diving Video Game Cart OEM Retro GREAT! 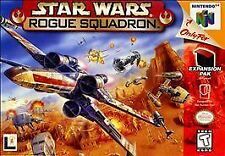 Star Wars: Rogue Squadron ( N64 ) -. Star Fox 64 (Nintendo 64, 1997). Condition is Very Good. Shipped with USPS First Class Package. STAR FOX 64 NINTENDO 64 N64. See photos for condition. Fast, free shipping. Star Fox Nintendo 64 N64 . Condition is Good. Shipped with USPS First Class Package. Notes: Tested. Condition: Good. SKU: SD50785. Hey You, Pikachu (Nintendo 64, 2000) GAME MANUAL ONLY! NO GAME INCLUDED! They have sat, and most are in great condition! I am upfront and honest as can be! Includes:MANUAL ONLY! 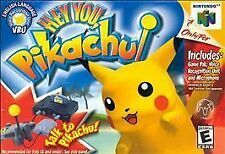 4.5 out of 5 stars - Hey You, Pikachu (Nintendo 64, 2000) GAME MANUAL ONLY! NO GAME INCLUDED! 79 product ratings79 product ratings - Hey You, Pikachu (Nintendo 64, 2000) GAME MANUAL ONLY! NO GAME INCLUDED! N64 Star Wars Rogue Squadron box & inserts. Box Only. Not in great shape. N64 Star Wars Rogue Squadron box & inserts. Box Only. Not in great shape.. Condition is Acceptable. Shipped with USPS First Class Package. 4.5 out of 5 stars - N64 Star Wars Rogue Squadron box & inserts. Box Only. Not in great shape. 110 product ratings110 product ratings - N64 Star Wars Rogue Squadron box & inserts. Box Only. Not in great shape. Game is tested and working. Has some back label wear. Manual is in good condition. Box is heavily worn with creasing on side. Star Wars: Rogue Squadron. Everything is in good to near mint used condition, with signs of wear on the box. Check out the photos! The 12-Star Quality Check. This item does not have finger prints on it. Box and white insert tray only. Has wear on box. You get exactly what is pictured. Authentic, genuine, official, Nintendo release. For sale is an original N64 hey you. Tested and in good shape. Star Wars Rogue Squadron Nintendo 64 N64 OEM Authentic Video Game Retro GREAT! 4.5 out of 5 stars - Star Wars Rogue Squadron Nintendo 64 N64 OEM Authentic Video Game Retro GREAT! 110 product ratings110 product ratings - Star Wars Rogue Squadron Nintendo 64 N64 OEM Authentic Video Game Retro GREAT! NINTENDO 64 N64 STAR WARS ROGUE SQUADRON VIDEO GAME CARTRIDGE ONLY - TESTED! 4.5 out of 5 stars - NINTENDO 64 N64 STAR WARS ROGUE SQUADRON VIDEO GAME CARTRIDGE ONLY - TESTED! 110 product ratings110 product ratings - NINTENDO 64 N64 STAR WARS ROGUE SQUADRON VIDEO GAME CARTRIDGE ONLY - TESTED! Star Fox 64 (Nintendo 64, 1997). Condition is Acceptable. Shipped with USPS First Class Package. New ListingStar Fox 64 (Nintendo 64, 1997) Authentic N64 Game - Tested - Works GREAT! 5 out of 5 stars - Star Fox 64 (Nintendo 64, 1997) Authentic N64 Game - Tested - Works GREAT! 288 product ratings288 product ratings - Star Fox 64 (Nintendo 64, 1997) Authentic N64 Game - Tested - Works GREAT! Rogue squadron for N64, in fantastic shape. Box, manual, and cart are all in pristine shape. Cart is tested and cleaned and plays great! See pictures. In my opinion the best star wars game for N64. Put a great copy in your collection for a good price. Guide has some light wear but no rips or tears. Great package for the star wars fan in your life! Help me declutter my house and send my daughter to college with your purchase! Star Wars: Rogue Squadron. Nintendo 64. The original box and instruction manual are. worked perfectly. You may be able to plug your own microphone/headset for it to work. For sale is Starfox 64 for the Nintendo 64. 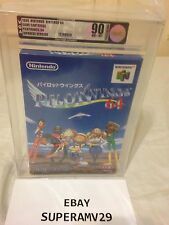 This listing is for the game and box ONLY. Game has been cleaned and tested and it works. Box has a few bad spots on it but solid overall. Check out the pics to see for yourself. If you have any questions please ask. Thanks for looking!!! · We operate in Ocean County, New Jersey. You can rest assured that your order will make it there in one piece. Used, but with original box and receipt. Everything is original and authentic, not reproductions. Rumble Pak still works and looks gray. Star Wars Rogue Squadron for Nintendo 64. Nintendo 64. Nintendo DS. Nintendo NES. Super Nintendo. This item is genuine, original. How long will my order take to arrive?. If you are not happy with it we will work to fix the problem. N64 Starfox 64. Label is In Very Good Condition with Little Wear. Shell has a Few Scratches. Front top left has small dent. Need VRU & Microphone to play. These will have physical wear/tear, but will work just like they should! NTSC-USA/CAN Format. 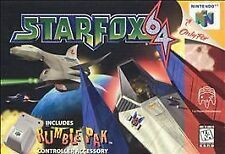 New ListingStar Fox 64 StarFox Nintendo 64 ! !FREE US S&H!! Star Fox 64. Nintendo 64. FREE Trial! 5 out of 5 stars - Star Fox 64 StarFox Nintendo 64 ! !FREE US S&H!! 288 product ratings288 product ratings - Star Fox 64 StarFox Nintendo 64 ! !FREE US S&H! !